Knives are survivalist’s best friend. Not only do you need them for skinning and chopping, they also come in handy as a defensive weapon. You never know what kind of danger you might encounter in the wild. However, typical knives aren’t suited for combat. Even though you might think that anything with a sharp edge will do in times of emergency, wouldn’t it be better if you have a versatile knife that’s good for both practical purposes and survival situations? That’s what the best bowie knife promises to provide. Bowie knives usually have a clip tip that makes them well-balanced and really easy to use for chopping and skinning, but it doesn’t stop there. They are the most popular combat knives, and the sharpness and durability of their blade make them a reliable tool for survival. Bowie knives can be expensive but that’s because they really are a high-quality and all-purpose tool. Today, bowie knives have flooded the market as manufacturers try to follow up on the knife’s popularity. Picking the knife that suits your needs the most might be an overwhelming task, but we are here to help! 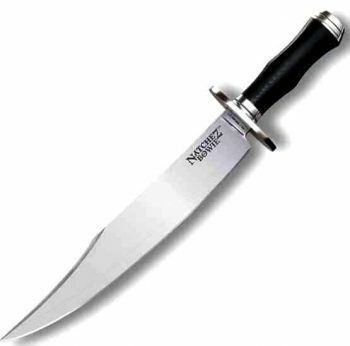 In this article, we will help you choose the bowie knife that fulfills your needs. First, we will look into some of the most important features that you should consider when buying, as well as several top choices available on the market. Let’s take a look at some knives! The perfect size of your bowie knife depends on what you plan to use it for. If you are planning to use your knife like a machete or for actual combat situations, you should consider a larger knife. Bowie knives top out with a blade length of around 24 inches and a total length of 30 inches. If you plan to use your bowie knife in the same style you would a camping knife you should consider a smaller blade. Bowie knives are characteristically large but can have blades as short as 5 inches and a total length of around 12 inches. The length of the blade may also be dictated by local legislation. Many jurisdictions have rules to regulate the length of the blade you are allowed to own or carry. It is also worth noting that a handful of legislation restricts or ban bowie knives by name. These specific bans are dated and were passed as a way of controlling dueling decades ago. The bowie knife has a long history dating all the way back to 1830 when James Black created the knife for its namesake, Jim Bowie. Jim Bowie went on to popularize the knife in his famous duel known as the Sandbar Fight. As a knife that has its roots in dueling, naturally the strength of the blade is very important. As an all-purpose knife, the bowie knife needs to be made from a steel that can both hold an edge and withstand impacts. Sadly, those characteristics are mutually exclusive in a metal. However, there are techniques that allow for both of these characteristics to be present in one knife. The best way to achieve this outcome is to laminate a hard steel over a softer tough steel. This allows your knife to hold its edge while also being able to withstand impacts when chopping. It is also important to note that there are three different distinctions of blade steel: high carbon steel, stainless steel, and laminated steel. Each of these materials has their pros and cons. High carbon steel is very tough and can be easily sharpened to a very sharp blade. Unfortunately, they are susceptible to corrosion. Stainless steel can be brittle, but it is not susceptible to corrosion and can hold an edge better. The designs of both the blade and the edge are also important factors when selecting a bowie knife. By selecting a blade with the iconic clip point you will have more control over the tip of your blade. A clip point refers to the blade shape where there is a concave arc to the tip of the blade. It creates an effect that makes the blade look like a portion has been clipped off. Other options include the drop point and straight back blade shapes. The drop point will also allow you more control of the tip of your blade, while the straight back shape sacrifices tip control for a longer slicing edge. Speaking of edges, the edge design of your blade is important because it will dictate the chopping and carving abilities of your blade. Typically, bowie knives feature a straight edge that works well as an all-purpose knife. It does not stand out in any tasks, but it provides the best overall performance. If you are looking for more chopping ability you should consider a recurve blade. This will allow your blade to move the balance point of your blade further toward the tip to increase the chopping power. Larger knives are especially prone to breaking at the point where the handle and blade meet. It is important to verify that the construction of the tang is strong enough to withstand your use. A full tang runs the full length and width of the handle and is the strongest and heaviest construction method. Following the full tang, a hidden tang is slightly smaller. It nearly extends the full width and length of the handle. Hidden tangs are slightly lighter and weaker. Finally, the partial tang is the smallest and weakest of all tang types. Make sure you verify that your blade will be able to handle the tasks you throw at it. Finally, on the topic of handles, the handle shape and material is another important factor. The perfect handle shapes vary from person to person, but you should verify that the handle is not too large or small for you to get a proper grip on. An improper grip on a large heavy knife can spell disaster. You should look for a handle material that is tough, won’t crack in cold or warm temperatures, and will not be damaged by liquids. You may also consider shock-absorbing materials if you plan to use your bowie knife for chopping. 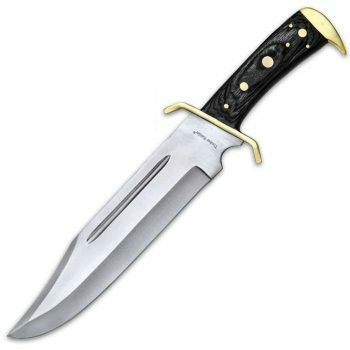 After going through the basics considering bowie knives and the features to consider, let’s see the top choices available on the market. 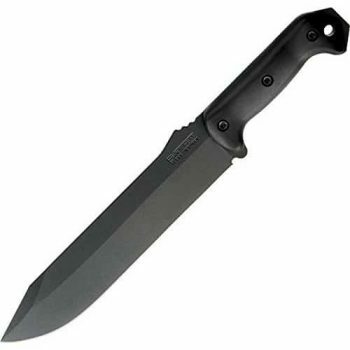 The Super SOG Fixed Blade Bowie Knife is the top of the line when it comes to Bowie knives. This blade is both stunning and functional thanks to its great blade shape. The blade features a clip tip that makes it exceptionally easy to control despite its size. The total length of the blade is 14 inches and the blade weighs just over a pound. The length of the blade itself is 7.5 inches. This places it at the smaller and generally more practical side of Bowie knives. The straight edge blade is coated with a black TiNi finish, which makes the knife both more functional and attractive. The full tang on this blade makes it incredibly strong while still maintaining great balance. The blade features a beautiful handle made of leather washers to provide an ergonomic grip that looks natural. This combined with the perfect gridlines and color will make all of your friends envious. The blade comes with a lifetime warranty and includes a very high-quality black leather sheath with a belt loop attachment. The knife also has a lanyard option. Overall, this is one of the best blades you can buy. It will last forever, and if it doesn’t SOG will replace it for you. Related: If you plan to invest in this high-class bowie knife, don’t forget to purchase this SOG SH-02 Countertop Sharpener Gear alongside it. Other sharpeners won’t work as well as the one specially designed for this bowie knife and you wouldn’t want to accidentally damage the high-quality steel. 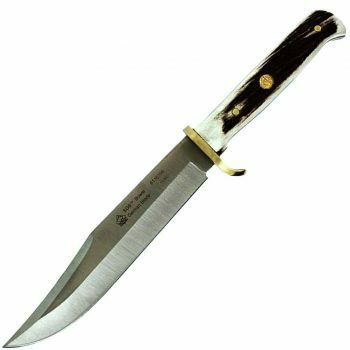 The PUMA SGB Stag Bowie Knife is one of the smaller blades on this list. Coming in at 11 inches in total length and weighing only 12 ounces it will be light in your hand and easier to control than the other blades on this list. The length of the blade itself is a very manageable 6.1 inches. Thanks to the clip tip and light weight this blade is easy to control in precise cutting situations. The blade also features a stunning stag handle and brass guard to make it one of the more attractive knives on the list as well. The blade is made of stainless steel 440°C that will give it a very sharp edge. As well as being sharp, this blade will hold its edge well no matter what you put it through. The choice of material is perfect for a blade this size since it isn’t quite big enough to be used for batoning or chopping wood. This blade features a hidden tang, which helps to balance it and provides plenty of strength for the undersized Bowie. Related: This bowie knife is perfect for survival purposes. If you often find yourself in rather precarious situations while you’re out there in the wild, don’t forget to purchase this EMW 5000 Lumens Flashlight too. This super bright flashlight will surely come in handy. 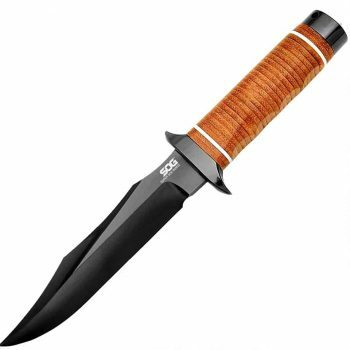 The Ka-Bar Becker BK9 Bowie Knife is a fixed blade knife that looks as intimidating as a combat knife should. It is used by all branches of the military and service members. The black, epoxy coated blade comes razor sharp and will hold its edge well. 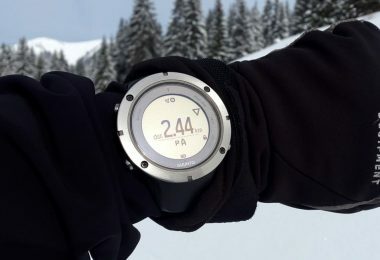 The full length of the BK9 is 14 ¾ inches and weighs in at a well-balanced 1.05 pounds. The blade features a small clip tip that is both functional and aesthetically pleasing. The blade is very high quality and is manufactured in the state of New York. This knife will work well in the field and be less fatiguing to use than many other blades its size. The all black blade features a matching, black, ergonomic Grivory handle to help stabilize your grip and minimize user fatigue. The 1095 Cro-Van steel blade will sharpen easily and is tough enough to handle anything you can think of out in the woods. This blade is strong enough for batoning and will last years. Even after you’re finished out in the woods, you’ll find that your blade is still razor sharp. You get what you pay for with this high-quality blade. You won’t regret a penny. One thing, though. This company does not offer a very good warranty. For its price, one would expect at least a limited lifetime warranty, but Ka-Bar pretty much will only offer a replacement if there’s a manufacturing defect. Related: If you’re looking for another handy and durable survival gear that doesn’t require much maintenance just like the Becker knife, this TITAN Paracord Survival Bracelet is a top choice. It’s very versatile. You can use it as a fishing line or a snare wire and best of all, it looks very stylish around your wrist. The Cold Steel Natchez Bowie Knife is a noticeably long blade. The length, the slight curve to the blade, and the noticeable clip tip make it eerily similar to a razor-sharp short sword. The knife has an overall length of 17 1/8 inches and weighs in at a hefty 2 pounds. The blade itself is 11 3/4 inches and is perfectly shaped to provide a balance of strength and leverage. The blade also features vacuum heat-treated VG-1 San Mai III blade construction. The workmanship of this blade is unparalleled. The handle is made of linen Micarta that will provide a good grip and also dampen any vibrations to your hand. The shape of the handle is suitable for a wide variety of gripping methods, which makes for easy chopping. This blade does not feature a full tang, however, the reason it doesn’t is to help balance this blade. One of the first things you’ll notice is how well balanced this blade is, especially for its size. It also comes with and holds an outstanding edge that will make any cutting easy. The quality of this blade is unmatched and when you hold and use the blade you can feel the benefits of the meticulous attention to detail. Unfortunately, that fine workmanship comes with a slight tradeoff: the weight. It’s quite heavy and may not be suitable for practical, everyday purposes. Related: This bowie knife wouldn’t look out of place sitting on a weapon collector’s shelf. If you’re a fan of fine weapons, you wouldn’t want to miss out on this Cold Steel Viking Hand Axe. This ax has a unique design but it’s also very practical. The Ontario Spec Plus Bowie Knife certainly looks like a fighting knife. This blade features a black epoxy powder coating to give it some added style and functionality. The SP10 is just a little bit over 15 inches in total length and weighs in at 1.4 pounds. The blade itself is 9.75 inches and features a full tang for added strength. The blade is manufactured in the USA in New York State’s scenic Southern Tier and comes with a lifetime warranty from the Ontario Knife Company. The Ontario Knife company is also a supplier to the US Government and Military. This knife is the real deal. The 9.75-inch blade is made from 1095 high carbon steel. The steel itself is hardened to 57-59 on the Rockwell Scale. The blade’s full tang combined with the size and toughness of the blade makes it perfect for chopping wood or batoning in the field. This knife will withstand any beating you put it through. The SP10 also features a Kraton handle, which will provide a secure grip and decrease impact on your hand when using the knife. The blade comes with a sturdy combination leather/Cordura sheath and lanyard. It’s worth it to spend a little bit more to get a blade of this caliber. But there’s one thing you’ll need to deal with before you can push this knife to full capacity: the grind. The workmanship is rather rough and would require some polishing. Related: If you manage to get the grind fixed, this knife is very versatile and should become a good survival partner. Speaking of survival trips, the one thing you should never forget is to have a good and reliable flashlight with you. This EdisonBright Fenix 1000 Lumens Tactical Flashlight is a great pick for the task. The Timber Rattler Western Outlaw Bowie Knife is a great knife for the price. It is very budget friendly but still manages to pack a lot of features and extras. The first thing you’ll notice about this blade is the size. It comes in at 11 3/8 inches and 2.4 pounds, which is on the heavy side but that shouldn’t be a deal breaker. The total length of the blade is 17 inches. It’s definitely not a shy blade. As you examine it further you’ll notice the classic gray hardwood handle and brilliant brass-plated guard. Together these features make it a blade your friends will surely be jealous of. The blade also includes a genuine leather sheath. This blade will excel at chopping. It features a very sturdy full tang and the sheer size of the blade will make any chopping easy work. The blade is constructed from very tough TR65 steel from Pakistan. The blade is easy to sharpen, which is good because you’ll have to sharpen it out of the box to get it razor sharp. You could easily replace a machete or hatchet with this ace. The intimidating size and style of this knife will empower you throughout your time in the woods. Related: As aforementioned, this knife needs to be sharpened quite often. In fact, you’ll have to sharpen it right out of the box before you can use it. That’s why you might want to purchase this Smith’s PP1 Pocket Pal Sharpener alongside the Timber Rattler. With this portable sharpener around, you won’t have to worry about the knife losing its edge while you’re out in the wild. 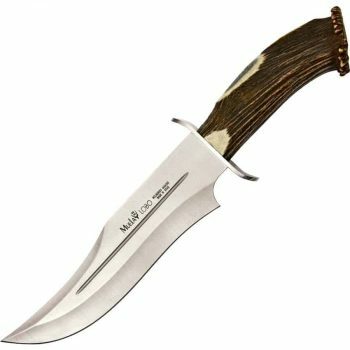 The Muela Magnum Crown Stag Bowie Knife is a great knife that features a crown stag handle with a solid brass guard. The recurve shape of this blade not only makes it great for chopping but also adds to its stunning appearance. This blade comes with a handcrafted full grain leather sheath and features a brass design on the bottom of the full tang that extends through the handle. The blades are handcrafted in Argamilla de Calatrava, Ciudad Real, Spain. The attention to detail on this blade is on a whole different level to its competitors. In fact, the blade features a lifetime warranty from Muela. Although this knife is well-balanced, it is definitely not a good choice for beginners because it is very large and heavy weighing in at 1.8 pounds. This knife is a perfect balance of production using the latest industrial techniques and artisan craftsmanship. This is a blade to be proud of. Whether you’re dressing a deer or chopping up wood this knife is a safe go-to for the avid outdoorsman. Related: If you plan to put this knife to good use by chopping wood with it, make sure you’re well protected from the cold winds. Wear this True Grit Pullover so you wouldn’t catch a cold while you’re preparing fuel for the fireplace. 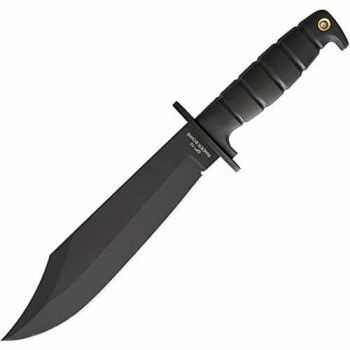 The Winchester 22-41206 Large Bowie Knife is a great deal. Its quality rivals more expensive knives at only a fraction of the price. The knife itself weighs slightly more than 1 pound. The total length is 15.8 inches. As a sizable knife, it can be used for anything from making precision cuts on meat to cutting rope and sharpening stakes on the campsite. It features a strong full tang and wooden handle that is both strong and aesthetically appealing. The knife also ships with a simple and well-built Winchester sheath which will come in handy out in the woods. It also features a brass guard. The knife is well balanced and sharp. In fact, it comes sharp enough to shave with out of the box. The knife is heavy duty enough for intense field work and any self-defense situations you might find yourself in. Surely it would fare well in a duel. The blade is made from AUS8 stainless steel which will prevent any corrosion and keep a very sharp blade. Don’t let the price fool you. This stunning blade will serve you well no matter what you throw at it. Be careful chopping wood with this knife though, the wooden handle can be slick and the stainless steel is slightly on the brittle side. Related: To make sure you don’t cut yourself while handling this very sharp bowie knife, wear a pair of this NoCry Cut Resistant Gloves. With these gloves, you can even counteract the knife’s unsuitability for chopping because even if the slick wooden handle makes the knife slip out of your hand, you won’t get hurt. This concludes our product reviews. All in all, the right bowie knife for you depends more on what you plan on using it for than anything else. The wide range of sizes, prices, materials, and styles mean there is a good option for anybody. So before buying a bowie, make sure that you determine your needs so you can buy a blade that’s right for you. Don’t be intimidated by the price. 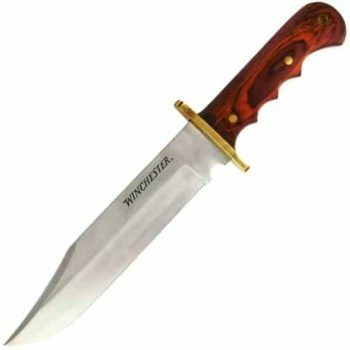 A good bowie knife will become your best survival partner, so make sure to invest in one that will last for a long time and is a pleasure to wield. Are you a fan of Bowie knives? Which Bowie would you highly recommend? Was it included in this article or did we miss it? Let us know in the comments!